The U.S. president Donald Trump and Vietnam president Nguyen Phu Trong together with senior leaders of Boeing and the Vietnamese airline Vietjet met in Hanoi today. The reason was not only the upcoming summit with North Korean leader Kim, but also an important step for the USA and Vietnam in the aviation industry. 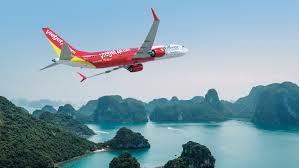 In Vietnam Boeing confirmed that the Vietjet has purchased 100 additional 737 MAX airplanes, taking their MAX order book to 200 jets. During a signing ceremony today in Hanoi, United States President Donald Trump and Vietnamese Communist Party General Secretary and President Nguyen Phu Trong joined leaders of both companies to unveil the $12.7 billion order, according to list prices. The Vietjet deal includes 20 MAX 8s and 80 of the new, larger MAX 10 variant, which will have the lowest seat-mile costs for a single-aisle airplane and be the most profitable jet in its market segment. The order was previously unidentified on Boeing’s Orders & Deliveries website.